Nothing in life remained worth seeing but that didn’t mean Nessa wanted to go blind. Widowed and alone, life had seemed dim before, but nothing prepared her for the sudden blackness which shuttered her vision in a single moment. Now, months later, a brush of the cat’s tail threw her into a clawing panic. Creeping sensations inched along her skin until she batted them away. Once she smacked away a sunbeam which fell on her neck like a sultry breath. This week’s giveaway is an awesome print, ready for framing, which says “Don’t Blink. Blink and You’re Dead.” and a signed copy of Moving Violations. 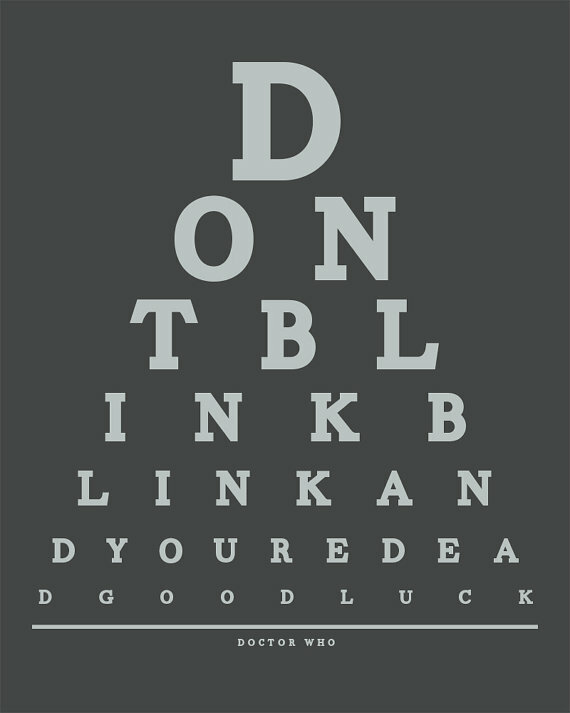 Apparently this is a Dr. Who quote (which I am not caught up on) but once I saw the print, I knew this was the perfect gift for fans of Sight Unseen. In order to enter, I’m asking you to like my author page on Amazon. Or as always, you may complete any of the previous week tasks (Tweeting, sharing on Facebook, becoming a fan on GoodReads, etc.) to enter. You must leave a comment on my blog or Like this Facebook post to be entered. The winner will be announced at 9 am on June 28, 2013. Thanks for playing!